Join Kelsey Reed Armbruster of Innercise Yoga, LLC for a retreat in the beautiful mountains of North Carolina! 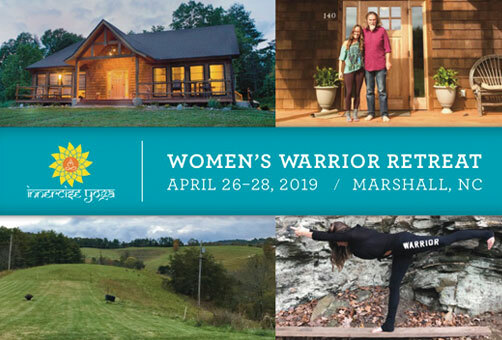 A fun-filled weekend intended to deepen your relationship with your inner warrior and create community. Daily yoga, vegetarian meals, fun local activities, and a strong emphasis on intuitive healing and transformation. Meet us at Prama Institute & Wellness Center for our opening ceremony at Friday, April 26th at 5PM. There will be 3 Innercise Yoga classes throughout the weekend – Hatha, Power Vinyasa Flow, and Gentle/Restorative Yoga. On Saturday, we will explore an on site hike and manifest meditation followed by an adventure into local city, Asheville, North Carolina*. We will visit the Asheville Salt Cave, explore downtown, and end with dinner at Laughing Seed Cafe. (Travel expenses will be paid, but dinner is NOT INCUDED per the retreat). Sunday’s agenda includes a 2 hour Wellness workshop with Tantric master Ramesh Bjonnes (author of Sacred Body Sacred Spirit). Prama Institute & Wellness Center does not permit alcohol or drugs on the premises. Please be considerate of this regulation.